Startup Management » Why Isn’t There a Bitcoin Global Bank Today? Why Isn’t There a Bitcoin Global Bank Today? 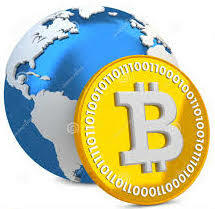 The Bitcoin vision is a global, yet decentralized money network with users at the edges of it. So, I’m asking the question- Since Bitcoin is global and universal, why isn’t there a truly Global Bitcoin bank? This is a tricky question, because Bitcoin’s philosophy is decentralization, and a bank is everything about central relationships. However, a global bank with no restrictions on borders or transactions would be interesting to users that want to conduct global transactions wherever they are in the world with the same ease as using a credit card. But here’s the bad news: this fictitious Central Global Bank will never exist, because local regulatory hurdles are too high and too real. There is no existing startup or bank with the incentives to become that “UBER” bank. The hurdles that UBER is currently facing against the taxi cartels pale in comparison to the complexities and intricacies of the regulatory, compliance, and legal barriers that are intrinsic to each local financial services system around the world. Do you know why HSBC is not really the world’s leading global bank, despite being in 72 countries? Do you know why Coinbase is not really the world’s leading Bitcoin Exchange, despite being the only exchange available in 27 countries? There is a common answer to these two questions: regulatory restrictions. This means that, as a customer, your account is silo’ed inside the country you belong to. So, you don’t really get the feeling of being global. HSBC and Coinbase are global, but their customers are not, because they don’t have access to seamless global services. So, here’s the good news in all this: the Global Bank is YOU, armed with a cryptocurrency wallet. A local cryptocurrency wallet skirts the legalities that existing banks and bank look-alikes (aka Bitcoin exchanges) need to adhere to, but without breaking any laws. The challenge today with the current Bitcoin wallets is they are islands without terrestrial connections, meaning without fiat on-ramps and off-ramps. The future of the cryptocurrency wallet is in your smartphone because it is already a gateway to a world of on-demand services. The weak link has been the on-ramps and off-ramps to the worlds of fiat currency and physical transactions. Maybe we just need more on-ramps and off-ramps in order to make the cryptocurrency wallets come to life. The banks are part of those on-ramps and off-ramps, but they will not be the centers of your wallet, just as they are today the centers of online banking. In the future, the banks might be a backend or lateral window to your decentralized wallets. Although a global bank or exchange is not happening any time soon, the feelings and behaviors of a global bank are needed. There is a historical reminder that online banking does not make a global bank. 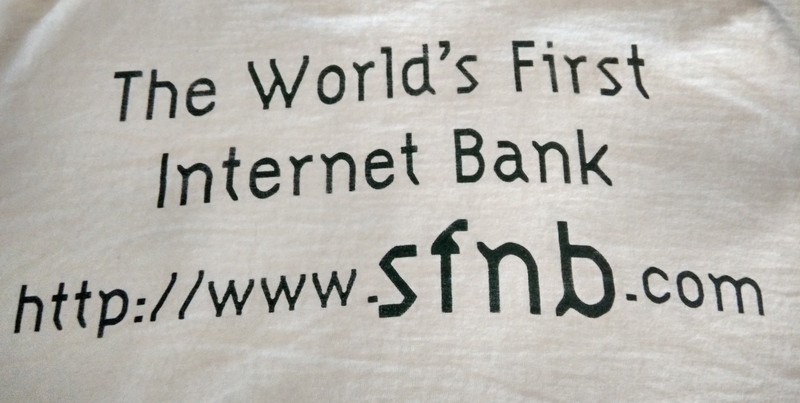 There were several attempts from 1995-2000 to form Internet-only banks, starting with Security First Network Bank (SFNB), the world’s first Internet bank, but each one of these attempts was confined the jurisdiction that they were created in. SFNB, CompuBank, Net.B@nk, Netbank AG, Wingspan, E-LOAN, Bank One, VirtualBank and others are such examples, but none of them survived past the dot-com crash of 2000. 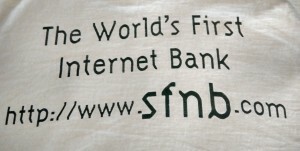 The following image is a shot from the back of an SFNB T-shirt I was given in 1995, when they launched. Today, we are seeing a new flavor of online/mobile only banks and financial services startups such as Simple, Koho, ZenBanx, Wealthsimple, GoBank, Moven, and Weathfront, and they do offer a new generation of services that leapfrogs the traditional banking ones. But none of them has the potential to automatically become a global bank, because they still need to knock down the local financial regulatory barriers. Today, a cryptocurrency wallet doesn’t enable these functions, but I expect future generations of wallets will. To spend Bitcoin, the conventional wisdom says we need more merchants and services accepting it. But although paying by Bitcoin is a cool thing, if you can’t do that, any other alternative is as good, and Bitcoin doesn’t really offer significant leapfrogging, except perhaps when it comes to micro-transactions. So, having more merchants accepting Bitcoin is not what will unlock its potential. I would argue that the cryptocurrency networks (enabled by blockchains) are more important than the currency itself. In the old metaphor that Bitcoin is “money with wings”, the wings that give speed are more important than the money itself. You can put *any* money on wings whether crypto or not, and you’ve got something new that didn’t exist before. Whereas today we are using traditional banking networks to transfer any type of money, I can see a future where we are using a Bitcoin infrastructure to transfer any money, including cryptocurrency and fiat. This means that fiat is coming to cryptocurrency wallets faster than cryptocurrency will come to traditional online banking accounts. Anything traditional will be slower. Maybe we could each one day become our own virtual bank. Cryptocurrency wallets could subsume existing banking relationships, and are that new entry point. A crypto wallet is to the world of crypto-finance networks what the browser was to the world wide web.